AGROVOC November 2018 release is out. With 35,966 concepts! AGROVOC team takes this opportunity to inform you about the AGROVOC November 2018 release. 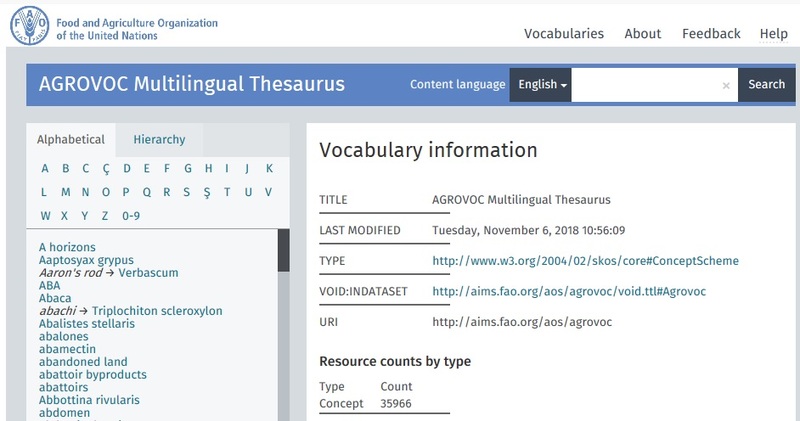 Note that starting April 2017, the FAO - AGROVOC multilingual thesaurus has been updated on a monthly basis (see all AGROVOC releases). You can search and browse for AGROVOC concepts and terms in SKOSMOS. covering (in up to 30 languages !) topics related to food, nutrition, agriculture, fisheries, forestry, environment and related sectors. Quite a few people use agrovoc-test to see the AGROVOC backend. In case you use VocBench: please note that AGROVOC content editing is now on VocBench3. A new registration for VocBench3 is needed. Web services and SKOSMOS links have not changed. The AGROVOC Team would like to express its gratitude to all AGROVOC Editors who are constantly contributing to AGROVOC releases, as well as to the ART: Artificial Intelligence Research group that provides technical support for AGROVOC Web services page. You also may want to look at the WSDL file for the AGROVOC Web Services. Keep up-to-date by Signing up for AIMS News, follow @AIMS_Community on Twitter.